Internet Librarian ended up worth it. There weren’t that many people, but our booth was mobbed even so. Some came for the free LibraryThing t-shirts (being secretly given out, but word got out), free CueCats barcode scanners or the free laptop stickers. Most came to see LibraryThing for Libraries and our new reviews feature. To my great surprise, people got the Facebook application. 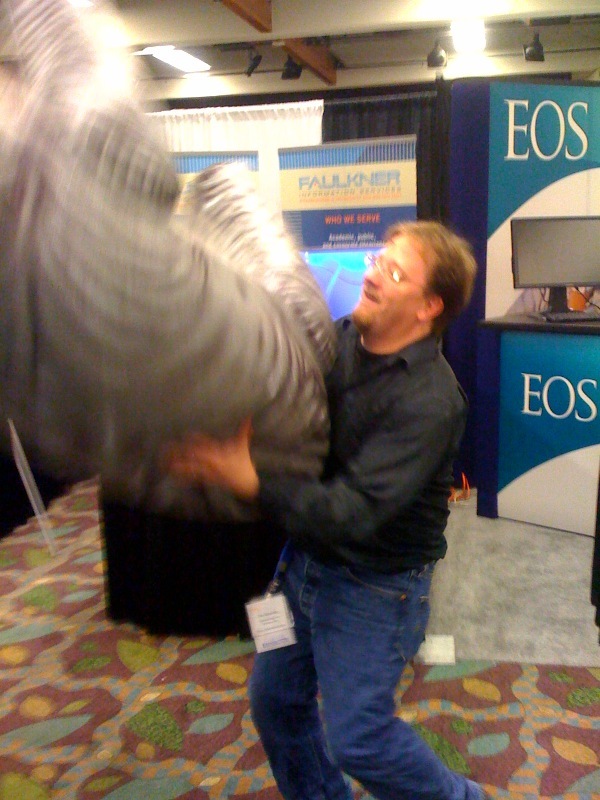 But what do you do when the conference is winding down for the day, and no customers are around. 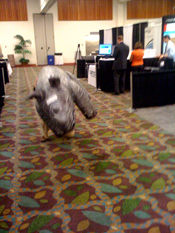 First, you run around with a rhino, attacking other exhibitors. 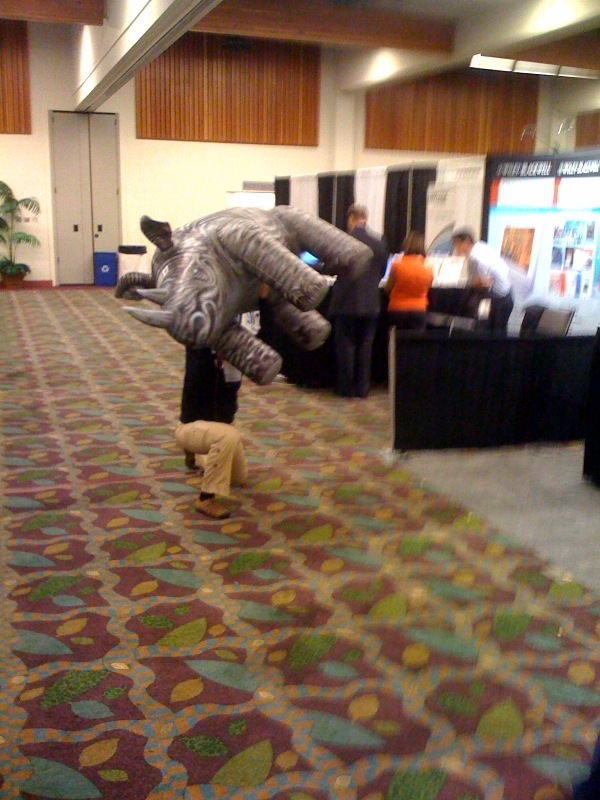 Then you settle down to a nice game of rhino-catch! Many apologies to the esteemed Christa Burns, whose presentation was affected by rhinos–mostly wondering what the heck was going on. Next party or conference, we’re going to organize a formal game of rhino sports. I think it’d be particularly fun to half-fill the rhino with water—a full rhino would be immovable—and see whom it burst upon. This blog rarely hosts up-to-the-minute reportage, but here it is: Internet Librarian is a bust! 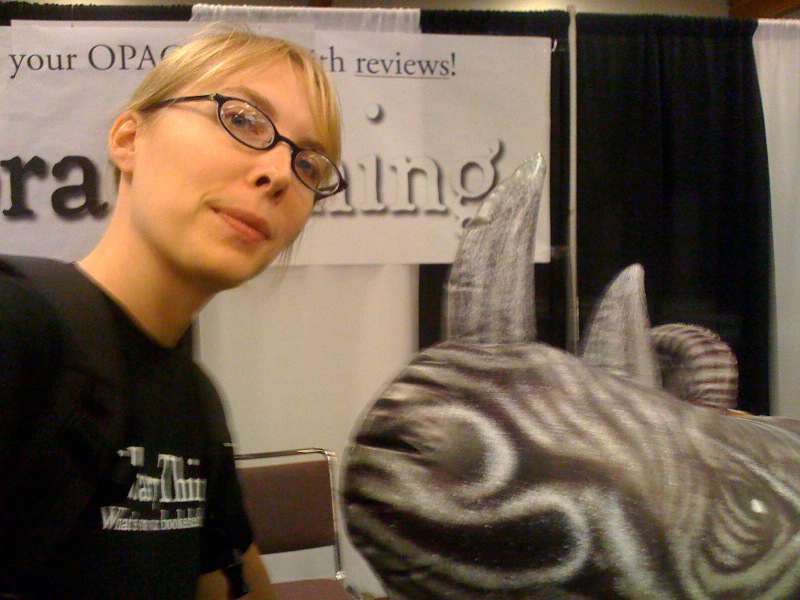 Most everyone we see loves LibraryThing for Libraries and our new reviews feature (announced today)—but nobody’s here! There are only two rows for exhibitors, and attendees aren’t walking them. According to an unnamed source—unnamed because I don’t know his name—attendance is way down this year. So, if you’re here, come by! We’d love to show you the remarkable new system we’ve built. And we’ve got laptop stickers, t-shirts and cuecats to give out. And we’ve got nothing to do tonight either. Last night Sonya and I had a business meeting at a Denny’s. Don’t make us do that again! Update: Things looked up for about 30 minutes. We’ll be at Internet Librarian in Monterey, CA, Monday-Wednesday. We’re at booth 316, in the boonies, I think. We’re going to blog “Reviews at My Library” on Monday or Tuesday, but you can take a sneak peak at reviews in action at High Plains Library District or Los Gatos Public Library.